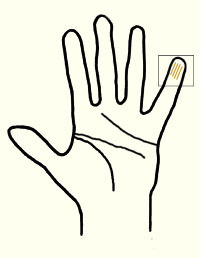 Hand Analysis is a modern take on traditional palmistry. It offers a pragmatic and systematic approach to shifting your life so that you can step into a fuller version of yourself. Lynn reads the hands as a means of diagnosis -- and then applies skill sets to shift your motivations and behaviors in your every day living. And - it's all presented with a smarts and a healthy dose of humor. There is no crystal ball. Lynn can not tell you how many children you will have or if you are going to die in a foreign land. This is a grounded approach to developing and using new skills for self actualization. Hand Analysis is therapeutic, though Lynn is not a licensed therapist. In the best cases, Hand Analysis can be very helpful in combination with formal therapy… and some clients are reported to have found Hand Analysis more helpful than formal therapy. Do you have 4 or more vertical lines only on the top phalange of either pinky (Mercury) finger? You have a message that people need to hear and you have the ability to understand complex information and distill it into layman terms. Penalty: Not using this gift makes you feel like you are chasing your tail. Suggestions: Write, sing, dance, take photographs every day. There’s an audience waiting to hear your message. If you don’t have this marking, don’t fret -- there are plenty of other gems to find in your hands.